The Health Savings Account. Only 20 million Americans currently have one and most are not taking full advantage of it. If you are using your health savings account (HSA) just for upcoming health care expenses (or do not have one at all), you are leaving money on the table. The reason you may be setting aside cash only for upcoming health care expenses in your HSA is because that is what these accounts were designed for. The idea is that those with higher deductibles may have higher out-of-pocket expenses and so could benefit from a health-specific savings vehicle. As such, you must be enrolled in a high-deductible health insurance plan to even participate in a Health Savings Account (HSA). Because of this philosophy, many leave their health saving account funds in cash (only 17.4% of health savings funds are invested) and the average annual contribution is well-below the legal limit. Instead, reimagine health savings accounts as a tool for building wealth – maybe the most powerful tool available. The power of the Health Savings Account (HSA) as a wealth-building tool springs from its unique tax advantages. Under current law, HSA’s enjoy a triple tax advantage: a current tax deduction, tax deferral on earnings, and tax-free withdrawals for qualified medical expenses. If funds in an HSA are invested for growth, this tax-saving triumvirate overpowers other savings vehicles such as brokerage accounts, IRA’s, 401(k)’s, Roth IRA’s, Roth 401(k)’s, and so on. Using conservative investment assumptions (specified in this blog), investing for 30 years to an HSA yields 63% more after-tax funds than investing in a brokerage account and 42% more than investing in an IRA or Roth IRA. And the relative benefits of the health savings account improve at an exponential rate with time. Investing HSA funds for growth. Contributing the maximum amount by law, if your budget permits, regardless of current health care expenses. Paying for health care expenses out of pocket and leaving your health savings account to grow for your future. Switching to a high-deductible medical plan just so that you can start contributing to a health saving account (assuming you are healthy, do not expect high medical expenses, and are willing to take on more of the year-to-year risk of unexpected health expenses). But if you are healthy, could you overfund an HSA? Health care costs tend to increase as we age and are expected to grow faster than almost any other cost in our budgets. Furthermore, the allowable uses for HSA funds are very broad (including Medicare premiums, dental and vision costs, and long-term care insurance premiums or expenses). Even if you need money for non-health-related issues, after 65 you can withdraw funds without penalties and just pay tax in same way as IRA or 401(k) withdrawals. Funding your future health care expense liability with a large health savings account nest egg can help you live how you want in retirement and beyond and not worry about growing health care costs eating away at your retirement savings. Health Savings Accounts (HSAs), are tax-deductible savings accounts designed to help individuals and families with out-of-pocket medical expenses (deductibles, copays, prescription medicine, etc.). While they are increasing in popularity (20% growth in 2016), adoption has been limited because they are not well known and 50% of employers still do not offer high-deductible plan options to employees. Health Savings Accounts are a recent invention. Enacted into law in January 2004, HSAs were designed as an update from Medical Savings Accounts (MSAs) and Archer MSAs. President Bush, who expanded Medicare by adding prescription drug coverage, Medicare Part D, also changed MSAs to HSAs and mandated that HSAs be linked to high-deductible health insurance plans (HDHPs). Therefore, to contribute to an HSA, you must be enrolled in a high-deductible plan. HSA-qualified plans must have sufficiently high deductibles and capped out-of-pocket maximums. The theory of the health savings account is that people with high deductibles should set aside cash for potential out-of-pocket expenses throughout the year. Furthermore, these savings should be tax-deductible in the same way as employer-sponsored health insurance premiums. Nerd Note: Technically the tax deduction for HSA contributions and premiums for employer sponsored health insurance premiums are considered salary reduction agreements. Essentially you are taking a reduction in salary and the employer is redirecting your reduced salary toward these health-related costs. The result is an above-the-line deduction and reduced FICA taxes. If the employer pays the cost, the expense is treated as a deductible business expense in either the HSA or insurance premium case. Also note that you get the “salary reduction” treatment if you contribute to an HSA even if you are not part of an employer-sponsored plan. The same is not true for insurance premiums. Also take note that since HSA contributions reduce your FICA taxes, if you are below the Social Security tax wage base limit, contributions to an HSA could have an effect on future Social Security benefits. Let’s illustrate why aligning the tax treatment is necessary with an example. Imagine you were single, had $3,500 in medical expenses each year, and are in the 24% marginal federal tax bracket (let’s ignore state taxes and FICA taxes to simplify this example). In one case, you have a low deductible policy with a premium of $383.33 per month and a deductible of $1,200. In a second case, you have a high deductible policy with a premium of $200 per month and a deductible of $3,400. Your total cost would be the same, but the higher tax deduction in the low-deductible policy would make it cheaper, after taking into account tax savings. However, if you had a health savings account and contributed $3,400, your after-tax cost would actually be lower than the low-deductible policy! 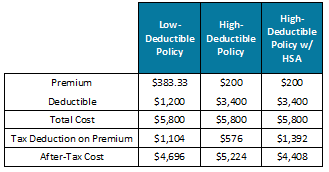 Nerd Note: The tax deduction for the low-deductible policy is calculated as follows: $383.33 premium per month x 12 months x 24% tax bracket = $1,104. The tax deduction for the high-deductible policy is calculated as follows: $200 premium per month x 12 months x 24% tax bracket = $576. The tax deduction for the high-deductible policy with HSA is calculated as follows: $200 premium per month x 12 months x 24% tax bracket + $3,400 deductible (assumed to be spend from an HSA with a current year contribution) x 24% tax bracket = $1,392. Note that these numbers were fabricated and there are a lot of moving parts that go into pricing premiums of various policies such as type of plan (HMO, PPO, POS, etc. ), network coverage, medical services included in coverage, prescription drug policies, etc. This example, however, illustrates the power of the tax deduction for premiums in employer-sponsored plans and the reason for creating a way to create tax deductions for higher out-of-pocket expenses in higher deductible plans with associated lower premiums. The case is even more powerful if you are an employee of a small business that does not offer health insurance benefits. These workers who must access health insurance as individuals do not get an above-the-line tax deduction on medical insurance premiums making the ability to access a tax deduction through health savings accounts all the more powerful. Nerd Note: If you are not able to get an above-the-line tax deduction for premiums by being part of an employer-sponsored plan or you pay medical expenses out of pocket, you are still eligible for a medical deduction. However, many will never get to take the medical deduction because it has a floor of 10% of adjusted gross income (7.5% if you or your spouse is over age 65). In other words, if you make $100,000, the first $10,000 of medical expenses are not deductible. Also, those who take the standard deduction would not get the medical expense deduction. If you are eligible to contribute to a health savings account, you can contribute $3,450 if your health plan only covers you. If your plan also covers your spouse or your whole family, you can contribute $6,900. If you or your spouse is age 55 or over, you can contribute an additional $1,000. Some plans allow both spouses age 55 or over to contribute $1,000 (technically the spouse opens their own HSA to contribute the $1,000). Contribution limits here are for the tax year 2018, but can be increased by the IRS to keep up with inflation. A health savings account is extremely flexible and can be used for a broad array of medical expenses. Way too many to list in full here. Included are the typical costs of copays and coinsurance for doctor visits, prescription drugs, lab and diagnostic tests. But many other expenses also qualify. For example, out-of-pocket dental and vision expenses can be covered. This includes prescribed eye glasses and Lasik surgery. Even over-the-counter drugs can be paid with an HSA if your doctor prescribed the over-the-counter medicine for a known medical condition before you incur the expense. Insulin is also included. If you have HSA money left as you age (which I will get to later), Health Savings Accounts can be used for Medicare Part B and D insurance premiums, long-term care services, and long-term care insurance premiums (up to a limit). You can actually also use your HSA for health insurance during a job transition for COBRA premiums or health care coverage while receiving unemployment compensation. It actually might be easier to list examples of what is not included: childcare (for a healthy baby), cosmetic surgery, hair treatments, teeth whitening, veterinary fees, etc. Just make sure the health savings account is open and funded before the medical expense occurs. Qualified expenses cannot be covered by HSA funds if incurred before the HSA is funded. Employers are incentivized to increase adoption of high-deductible plans and therefore offer health savings plans. First, low-deductible plans carry higher premiums. Many large employers cover all or some portion of health insurance premiums of their employees as a fringe benefit. For the employer, this can be very expensive. It could also be a waste. Healthy employees who don’t go to the doctor are not filing enough claims to make the high-cost insurance worth it. In my first job out of college, I was offered a robust health insurance plan in which the employer paid most of the premiums. I hardly ever went to the doctor and so I was over-insured and the employer was paying way more to cover me than necessary. You can also think of the difference between low-deductible vs. high-deductible plans as who is carrying the risk. Low-deductible plans transfer more risk to the insurance company. High-deductible plans transfer more risk to the insured (i.e. employees). As a result, people with high deductible plans are more likely to get involved in their health care – seeking out preventive care and participating in wellness programs and health assessments. Some believe consumer-driven care will lower system-wide costs and (for the most part) patients are more satisfied with their health plans. 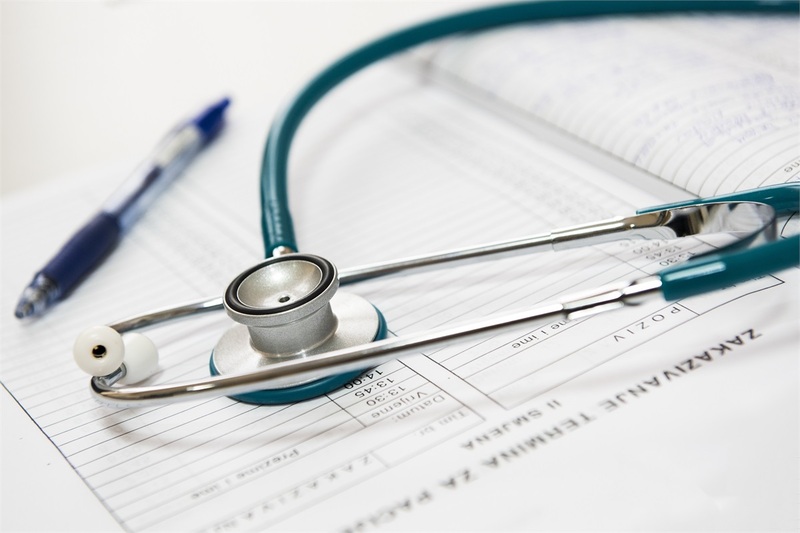 As a result, employers are encouraging the adoption of high-deductible plans, especially to employees who would be over-insured by low-deductible plans, to lower costs and control future increases to their health insurance benefit obligations. According to Mercer’s National Survey of Employer-Sponsored Health Plans 2016, about 50% offer an HSA-eligible health insurance plan. Some employers are even contributing to health savings accounts for their employees (which is tax deductible to the employer just as are paying premiums) as part of the benefit to level the playing field with the cost-sharing benefits of higher cost low-deductible plans (although, according to Mercer, this doesn’t seem to have much impact). Despite the power of the health savings account, only 24% of covered employees are enrolled in an HSA-eligible plan (i.e. half of those with an employer-provided HSA plan option). And even without taking into consideration the health savings account, a high-deductible plan could be attractive to certain participants on its own. If you know that you are healthy and unlikely to need much medical care, you can opt for lower premiums and absorb the risk of higher potential out-of-pocket medical costs. Whether people are good judges of their actual risk and know what out-of-pocket obligations they might end up on the hook for is a subject for another day. One other type of tax-deductible savings mechanism for health expenses is the Flexible Spending Account (FSA) which many employers still offer. If offered by the employer, you can contribute to this type of account in the form of a salary reduction (i.e. you pay no income tax or FICA taxes), regardless of what type of health insurance plan you are enrolled in. FSAs are limited to $2,600 per year per employer. FSAs are less flexible than HSAs with the largest sticking point being that FSAs are “use-it-or-lose-it” plans. In other words, the FSA account balance has to be zero by year end or the money you put in there is lost forever. How can I know what my medical expenses will be? Why should you be punished if you don’t get sick? The only solace is that employers can choose one of two options to make this fact easier to swallow: they can provide a grace period of up to 2 ½ extra months or allow a carryover of up to $500 per year to use in the following year. Because of this damaging feature, many recommend being conservative with your FSA contributions to known recurring medical costs to make sure you never get stuck with a balance at the end of the year. Even so, this is a stressful endeavor and so many choose not to participate at all. Another restriction of FSAs is that you generally lose your FSA if you change employers, while an HSA stays with you. FSA contribution amounts are decided at open enrollment or a special enrollment based on a life-qualifying event, while HSA contributions can change at any time. Flexible spending accounts can only be offered through employers. Therefore, the self-employed and employees of companies that do not offer FSAs cannot open them. Generally, you cannot enroll in an HSA and FSA at the same time unless your employer allows a “limited purposes” FSA such as being used only for dental and vision expenses. I propose, however, that you should consider funding the health savings account not only (or solely) for the purpose of covering current out-of-pocket health care costs. In fact, you should fund an HSA even if you don’t think you will have current medical expenses. But before I get there, there is one more important detail to cover. As previously noted, contributions to health savings accounts are tax deductible. Specifically, they are considered salary reductions, meaning that both income taxes and FICA taxes are reduced. For example, if you are in the 24% tax bracket and live in Virginia with a marginal state tax bracket of 5.75%, for each dollar you contribute to an HSA, your taxes go down by $0.30 (ignoring FICA taxes). Nerd note: the above calculation assumes you take the standard deduction, if you itemize, state taxes can also be a federal tax deduction and you may need to take into account lower state taxes in the overall affect. Therefore, the calculation of how much the deduction would be (1-state tax rate) * federal tax rate + state tax rate ($0.28 in this example). There are many other factors that can change how much impact a deduction has on taxes such as phase out of other deductions and alternative minimum tax calculations that have not been included here. This is why we use software to model effects of different financial strategies for each situation. Second, earnings on the account (interest, dividends, or realized capital appreciation) are tax-free. The account can grow to $1,000,000 and you would still never pay tax on these earnings (as long as they are used for medical expenses). Third, withdrawals from HSAs for medical expenses are tax-free. Compare this to a traditional retirement savings account such as an IRA or a 401(k). Just as with an HSA, IRA or 401(k) contributions are tax-deductible. However, withdrawals are fully taxable at ordinary income tax (versus HSA withdrawals, which are completely tax-free if used for medical expenses). Now compare this to a Roth retirement savings account such as a Roth IRA or Roth 401(k). Just as with withdrawals from HSAs for medical expenses, Roth withdrawals (contributions and earnings) are tax-free (barring certain restrictions out of the scope of this article). However, contributions for Roth accounts are not tax deductible. If you are following, the HSA gives you the benefits of BOTH the traditional IRA and Roth IRA. You get a tax deduction upfront. In summary, you are avoiding tax on the income used to contribute to the HSA AND building wealth without paying taxes on earnings. You can keep this going for a long time since your account balance carries over each year, unlike in a FSA. Observation 1: Tax-preferred accounts all do better than the brokerage account. This is not surprising. Nerd Note: Income from brokerage accounts such as interest, dividends, and capital gain distributions also create a tax liability year over year. Studies estimate this tax drag on investments could be high as 0.5-1% per year. This impact was not included here and would just make the brokerage account look worse. Observation 2: The IRA and Roth IRA do the same. Nerd Note: Although outside the scope of this article, one of the main determining factors for IRA and Roth IRA is your tax bracket now versus the future. If your tax bracket will be higher in the future, you would be better off with a Roth IRA as opposed to an IRA and vice versa. Observation 3: The HSA performs the best. After 30 years, $132,000 better than IRA or Roth IRA accounts (30% higher) and $173,000 better than a taxable brokerage account (47% higher). This is for a mere $5,674 per year investment for 30 years (approximately $170,000 total). The benefits of the HSA grow exponentially over time due to the power of compounding tax savings. The longer you invest your HSA for growth, the more disparity you will see in the results between the HSA and other investment vehicles. While HSAs have been traditionally used to pay for current medical expenses, you can see that investing these savings for health expenses for your future can really pay off. Realize that since most HSAs are used for current expenses, most HSA providers keep your contributions in cash. They operate like a bank savings account and you have a debit card to pay for medical expenses. This is changing. More and more HSA providers are providing investment options for participants. Online providers such as SelectAccount, Optum Bank, and HSA Bank offer self-directed brokerages with a wide variety of investment options and retail banks with brick-and-mortar presence such as BB&T offer a limited list of investment options. Account minimums to access investment options and fees vary so use a tool such as HSASearch or talk with your financial advisor to compare options. If your HSA is offered through your employer as part of your benefit package, you may need to go with the corporate option (especially if the employer is making contributions). For example, if your employer uses Fidelity as your 401(k) provider, they may also use Fidelity’s HSA platform. Can I Overfund my HSA? If you invest your health savings for growth, you may be worried that the account balance will grow exponentially and at some point outpace your potential future medical expenses. This could be a problem because you must use HSA funds for medical expenses or you pay tax on withdrawals and pay a 20% penalty if you are under age 65. Nerd Note: This is similar to how retirement accounts withdrawals like IRAs are treated if withdrawals are not taken for the intended purposes. The IRS defines the purpose of retirement funds to mean withdrawals after age 59.5. This worry is likely unfounded. You may have low medical costs now, but it would be a mistake to plan for these costs to stay low forever. Health care costs over the past ten years have been rising faster than inflation of the general economy and there is little sign that this trend will cease to continue. Health costs as you age are particularly important to plan for. According to HeathView Services’ 2017 Retirement Health Care Costs Data Report, retiree health care expenses will rise at an average annual rate of 5.47% for the foreseeable future. This is almost triple the U.S. inflation rate from 2012-2016 (1.9%) and more than double annual projected Social Security cost-of-living adjustments (2.6%). Fidelity estimates a 65-year-old couple retiring in 2016 will need $260,000 to cover health-care costs. If costs rise 5.47% per year for the next 30 years, Fidelity is implying you would need approximately $1.3 million for health care costs. If this is true, even if you contribute the maximum allowed by law to HSAs for your whole life, it may be hard to even save enough to cover your whole lifetime health care liability! Regardless, the uses for health saving account funds are quite broad, particularly for retirees. HSA funds can be used for Medicare Part B premiums, long-term care insurance premiums (within certain IRS-defined limits) and long-term care costs. And if for some reason your health savings account get so large you can’t spend it for health care costs alone? You withdraw funds after age 65 without the 20% penalty. This is the worst-case scenario for over-saving in the HSA. But if you think about it, this is how a traditional retirement account like a 401(k) or IRA works. You get a tax-deduction now, but have to pay tax on withdrawals. An extra retirement savings account? Not a bad worse-case scenario. Taking all of this into account, the HSA is most likely one of the best saving options available (aside from free money such as 401(k) matching). If you have an HSA, but haven’t considered the HSA as an investment vehicle, now is the time to increase your contributions and research whether investment options are available with your provider. If you don’t have an HSA, now is the time to check your health care plan options and reassess your medical insurance strategy during open enrollment. Of course, as with any financial strategy, prioritizing HSA funding affects the ability to fund other strategies and so be sure to discuss with your financial advisor how adding a growth-minded HSA to your arsenal will affect your comprehensive financial plan.